Complete your continuing education to renew your Colorado real estate license today. All of our courses can be completed At Your Pace online in order to help you maintain your license. 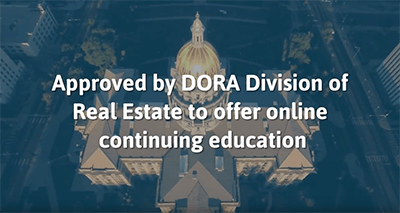 Once you finish your class you will have an official certificate of completion available to report your CE to the DORA Division of Real Estate. Most Colorado Real Estate Brokers are required to take 24 hours of Continuing Education every 3 years. Each year a required Annual Commission Update (ACU) course is designed to meet 4 of those hours. Taking the ACU every year will count for 12 of the 24 hours. The remaining 12 hours can be on Elective Topics. A student who takes this course will have completed the entirety of the 12 hours of elective training required by the State of Colorado. This 12 hour elective course is designed to provide real estate professionals with an overview of important topics and concepts. This package covers topics such as ethics, errors and omissions, and more! This course is approved by the State of Colorado to provide 4 hours of elective continuing education training. The course covers the common laws of agency, errors and omissions, and changes to Integrated Mortgage Disclosures. This is a 4 hour course for real estate professionals in Colorado, fulfilling the 4 hour Annual Commission Update Course requirement for 2019. In the course, we will cover topics such as compliance issues, current Fair Housing issues, electronic advertisements, unlicensed assistants, general practice, new regulations, and the resources available to the real estate professional operating in Colorado. 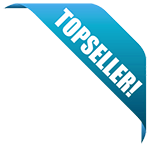 The real estate education course application you submitted for "Laws of Agency" has been approved for 4 hours of real estate continuing education credit towards license renewal. You may provide each student with a copy of the enclosed certificate, or you may provide any other form of course completion certification, as long as it meets the requirements of Commission Rule 8-10. If you use your own course completion certificate, please make sure that certificate includes the course number. Failure to do so may result in the credit being denied. If you use our REC-35certificate, please complete, sign, and date the certificate after the course requirements are met. Please do not pre-sign or sign blank certificates without the individual student name and date entered thereon. As the provider, you must keep course outlines and records of attendance for a period of four years. Please reference the below Course Approval Certificate # for any changes or corrections you need to make to this course. The real estate education course application you submitted for "12 Hour General Real Estate Concept s" has been approved for 12 hours of real estate continuing education credit towards license renewal. You may provide each student with a copy of the enclosed certificate, or you may provide any other form of course completion certification, as long as it meets the requirements of Commission Rule B-10. If you use your own course completion certificate, please make sure that certificate includes the course number . Failure to do so may result in the credit being denied. If you use our REC-35 certi ficate, please complete, sign, and date the certificate after the course requirements are met. Please do not pre-sign or sign blank certificates without the individual student name and date entered thereon. As the provider, you must keep course outlines and records of attendance for a period of four years. Please reference the below Course Approval Certificate# for any changes or corrections you need to make to this course.